Taking proper care of your fine jewelry is important! Chemicals such as hairspray, lotions, perfumes, and other cosmetics can permanently damage your jewelry. Knowing the basics about jewelry care can make a world of difference when it comes to retaining the value and beauty of your precious jewels. Fine jewelry should always be removed before swimming in a chlorinated pool, or before using household cleaners that contain chlorine or ammonia. Prolonged exposure to these chemicals can cause pitting and weakness in your jewelry's metal. We recommend cleaning your precious jewelry in a bowl of warm water, with mild soap (no detergents), and a soft toothbrush. If you are cleaning your jewelry in a sink, be sure to stop the sink’s drain or use a rubber mat, to prevent a loss down the drain. A pulsating-water dental cleaning appliance and a soft, lint-free cloth is a good option as well. Proper jewelry storage is also important. Jewelry should never be tossed into a drawer or on top of a dresser. This may cause scratches and fractures to your gemstones. Jewelry items normally come in a box or pouch from the store when purchased. Danforth Diamond offers both of these options. Keep these! They protect your jewelry and can be stored away in a jewelry box as well. Jewelry boxes with individually padded slots for rings, and posts for hanging necklaces and bracelets, are also ideal. When traveling with jewelry, protect the pieces from scratches or other impact damage by keeping the jewelry in a jewelry pouch or wrapped up in a soft cloth. Sterling silver, specifically, should always be kept in an anti-tarnish bag or cloth. A ring holder located by the sink is a great idea for storing your rings while doing dishes or preparing dinner. Keep one in the bathroom, as well! When traveling, leave your jewelry in a jewelry box or in the hotel room safe, if you are participating in activities such as mountain climbing or scuba diving. Renting a safe deposit box from the hotel is a good idea as well, if your room doesn't have a safe. Although warm water and mild soap is perfectly sufficient, we also recommend purchasing a small ultrasonic cleaner. 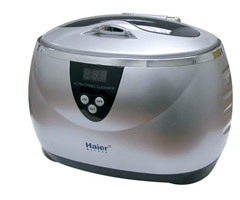 We suggest the Haier Ultrasonic Jewelry Cleaner (shown above), available for under $50 at www.meijer.com. An ultrasonic cleaner uses radio waves to loosen the dirt that can build up on your rings and other jewelry pieces. Generally, you just put your items in the container and the machine does all the work, resulting in very clean and sparkling jewelry. However, ultrasonic cleaners are not recommended for jewelry containing soft stones such as pearls, opals and amber. Make sure to read the owner manual before using on jewelry containing stones other than diamonds.